A grieving mother embarks on a mind-expanding journey in this novel. Lily, or “Lily the Pink,” as she is known at “naked yoga,” is a 60-something woman who is a member of the “strictly-by-invitation-only” website “come-to-woody.com.” The site allows “perfectly respectable” professionals to meet for anonymous sexual encounters in a “secret little wood somewhere north of Hampstead Heath,” London. She has a strained relationship with Gemma, her 29-year-old daughter, who “doesn’t approve of” her lifestyle. And yet elements of Lily’s hedonism are linked to her first child, Tommy, who died at 8 after slipping out of the hands of his irritated father, Frank, at bathtime and suffering a fatal fall. During one of her ventures to Hampstead Heath, the air-conditioning on Lily’s classic Mercedes fails. In the heat, she begins to experience strange phenomena. She sees her dead son in the eyes of a fly she identifies as the angel Ithuriel. She later encounters two men, one of whom she instantly recognizes as “the devil incarnate.” All the while, Lily consults with her alter ego, Bella, nicknamed the “Unexploded Bomb.” As in his previous novels, Cacoyannis (The Madness of Grief, 2018, etc.) deftly builds complex psychological portraits of his characters. Here, his fiction employs magic realism to both blur and sharpen Lily’s shifting mindscape. As she sits in the suffocating heat of the car, her altering vision is at first understandable: “Trickles of sweat had already found their way into her eyes, but she could see. The slight blurriness—the effect was of an old-fashioned photograph fuzzy from the grain of excessive enlargement.” Aberrations in her vision later become the “colourful brushstrokes” of a migraine aura, but she also inexplicably sees, behind a fly’s “ruby domes,” unmistakable eyes far more piercing than hers, belonging to her dead son. The author delights in leading readers to the unsteady territory between the possible and the impossible. His writing is intentionally disorienting and unnervingly addictive as readers grapple to make sense of two or more separate realities sown seamlessly together. Cacoyannis is known for his introspective protagonists, but in this exceptional novel he delves even deeper, excavating the darkest corners of the psyche. 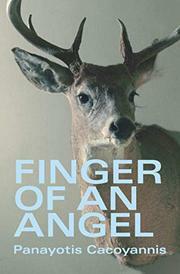 An erudite, richly layered, and unsettling psychological tale.